MSNBC's "Morning Joe" on Tuesday mocked Sen. Kamala Harris (D., Calif.) for her awkward response to questions about her tweet calling the alleged attack on actor Jussie Smollett a "modern-day lynching." 2020 Democratic presidential candidates were quick to pounce on the alleged attack of Smollett, a gay, black actor, after he claimed he was the victim of a hate crime in late January. He initially alleged two men beat him up in a Chicago street, poured bleach on him, placed a rope around his neck, and yelled, "This is MAGA country," referring to President Donald Trump's "Make America Great Again" campaign slogan. However, the narrative changed over the weekend when it was reported Chicago Police are now investigating whether he orchestrated his own attack. Authorities suspect the actor paid two brothers, who are now cooperating fully with law enforcement, to carry out the purported attack. "Morning Joe" co-host Mika Brzezinski played a clip of a reporter asking Harris about her tweet from Jan. 29 reacting to Smollett's initial story. She praised Smollett in the tweet as "one of the kindest, most gentle human beings" she knows. "This was an attempted modern day lynching," she added. "Which tweet? What tweet?" Harris asked the reporter during an appearance at a bookstore in Concord, New Hampshire. "About saying that it is a ‘modern day lynching,'" the reporter said, prompting Harris to look to her left for an unknown reason and laughing before facing the reporter again, who added, "Jussie Smollet." "Um, uh, OK, so, I will say this about that case. I think that the facts are still unfolding, and, um, I’m very, um, concerned about obviously, the initial, um, allegation that he made about what might have happened," Harris said, according to the Fox News report. She went on to say everyone could comment after an investigation has been completed. "And I think that once the investigation has concluded then we can all comment, but I’m not going to comment until I know the outcome of the investigation," she said. Co-host Joe Scarborough responded to clip by saying Harris looked like she didn't know anything about the tweet. He then quickly clarified that he wasn't making any excuses for her and that "the buck stops with her." 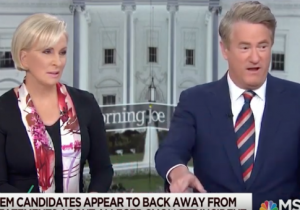 Mike Barnicle, a frequent "Morning Joe" guest agreed with Scarborough and said she did "as well as you can do" in a moment when you don't have a response. He then proceeded to imitate Harris's gestures. Guest Tom Nichols, explaining he was once a Senate staffer, warned Harris against throwing her staffers under the bus for the tweet. Brzezinski said if the 2020 hopeful did send the tweet herself, she needs to take full ownership. "Do you really think these candidates are tweeting 24/7? No. They have people tweeting for them and let me tell you, ‘Stop.' Only tweet when you're tweeting. It's not going to work otherwise," Brzezinski said. "When you have people tweeting for you. Ooh. It's not helpful, and something like that will happen. If she did tweet that, she's going to have to completely roll it back and take ownership for it." She further warned about jumping to conclusions when it comes to the Smollett case, advice many in the media didn't heed in their immediate response to the actor's accusations. "We don't know what happened, and this is a problem. Everyone thinks mob rule is where we are going to go. It's not going to work in the elections. It's not going to work for Democrats," Brzezinski said.